Lake Tahoe, straddling the state line between Nevada and California, ranks as one of the world’s most spectacular mountain lakes. Pyramid Lake and Walter Lake are remnants of ancient Lake Lahontan that covered much of northwestern Nevada during the last Ice Age. Over two dozen rivers and streams run through Nevada although only a few are navigable and most are ephemeral or intermittent. More than a dozen reservoirs are in Nevada including Lake Mead and Lake Mojave. Known mostly for its arid desert landscapes, less than 1% of the state (760 square miles) is covered by water. What is Nevada’s maritime heritage? People have been using Nevada’s lakes and rivers for more than 12,000 years. The earliest evidence comes from Paleo-Indian sites located around ancient Lake Lahontan and along the Colorado River. Historically, the Washoe tribe lived around Lake Tahoe and adjacent areas of the Great Basin, the Northern Paiute lived around Pyramid Lake and adjacent areas of the Great Basin, and the Southern Paiute lived in the Colorado River Basin. In 1844, the American military officer and explorer John Fremont led an expedition to the Great Basin and recorded Lake Tahoe and Pyramid Lake. Settlers began arriving in 1851 and prospectors raced to the area after the discovery of the Comstock Lode in 1858. Lake Tahoe became a center for the logging industry, providing timber for the underground mines. 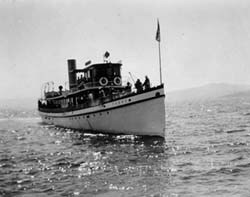 Lake Tahoe also became a favorite vacation spot with steamships providing regular service around the lake. Lake Tahoe and Pyramid Lake were fished commercially for trout that were shipped to the West Coast and to the Comstock. The native fish stocks have declined over time and today fishing is only for recreation. There are many submerged sites in Nevada’s rivers, natural lakes, and reservoirs. This includes shipwrecks and aircraft as well as ruins of prehistoric and historic sites and towns that became inundated when the reservoirs were filled with water. It also includes submerged structures, buildings, and transportation features associated with the construction of the reservoirs. Two examples of shipwrecks on the bottom of Lake Tahoe are the 19th century steamers Meteor and Tahoe. Both vessels had long careers carrying passengers, mail, and freight across the lake, and Meteor spent an additional 20 years towing log booms. The need for lake steamers had declined by the middle of the 20th century with the advent of the automobile and the construction of roads, and both vessels were scuttled by their owners. In 2002, the wreck of the Tahoe became Nevada’s first submerged site listed in the National Register of Historic Places. Two aircraft are on the bottom of Lake Mead in the state of Nevada. This includes the wrecks of a B-29 Superfortress bomber that crashed in the Overton Arm area in 1948 and a PBY-5A Catalina flying boat that crashed into the Boulder Basin area in 1949. In 1994, the B-29 was determined eligible for the National Register of Historic Places. Both aircraft wrecks are accessible only to qualified technical divers with special permission from the National Park Service because of the great depth at which they lie. Who takes care of Nevada's underwater archeological sites? The Federal Government takes care of many archeological sites in Nevada because it holds approximately 86% of the land in the state. This includes public and Indian land managed by the Bureau of Indian Affairs and the respective Indian tribes, the Bureau of Land Management, the Bureau of Reclamation, the Department of Defense, the Department of Energy, the Fish and Wildlife Service, the Forest Service, and the National Park Service. The State Historic Preservation Office in the Nevada Department of Cultural Affairs plans and coordinates archeological activities within the state and protects cultural resources on state lands. In the same Department, the Division of Museums and History collects, preserves, and interprets objects relating to the state’s prehistory, history, and natural resources. Within the Nevada Department of Conservation and Natural Resources, the Division of State Parks protects and interprets archeological sites in state parks, and the Division of State Lands administers state lands including lands underwater. You need a Nevada Antiquities Permit from the Nevada State Museum to investigate, explore or excavate an archeological site on state or federal land in Nevada. You also need a Permit for Archeological Investigations from the appropriate federal agency when the site is on federally owned or controlled land. Permits are issued to qualified individuals at reputable museums, universities, colleges, or other recognized scientific or educational institutions for the purpose of increasing knowledge. Any materials removed or recovered must be placed in a public museum or other recognized educational or scientific institution for permanent preservation. What laws concern underwater archeology in Nevada? Nevada’s laws relating to protection and management of archeological sites are set forth in several Titles in the Nevada Revised Statutes. Most of these laws are in Title 33 including Chapter 378 that covers the Department of Cultural Affairs and the State Library and Archives, Chapter 381 that covers State Museums, and Chapter 383 that covers Historic Preservation and Archeology. State Parks and Monuments are covered in Chapter 407 of Title 35, and Navigable Waters are covered in Chapter 537 of Title 48. Many federal laws provide authorities for protecting and managing archeological sites. Some of these laws apply government-wide while others are agency-specific and apply to particular lands or resource types. A list of laws and other authorities is posted on the History and Culture page of the National Park Service’s website.